The new and selected poems in this “Writing Anew” are children of a man I got to know as a professor first and poet only later. His writing is as much personal revelation as it is worldly insight. Aspects forgiving, adoring, and observant decorate pieces that range from pastorals to odes to narratives concerning life and everything in-between. Exemplary, concise writing lends to the first section, New Poems, a slap in the face to readers who are too occupied with plot to sit and chew. These selections, which rarely waste words, offer a scene with no place to go but inwards. 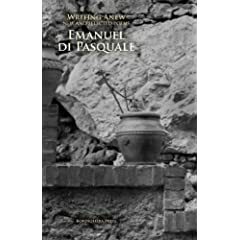 Much like haiku, Di Pasquale has a talent for recognizing images pregnant with meaning and has a rare talent for sculpting said scenes. Abandon all desire for travel and pull out the magnifying glass of these words to examine exactly where it is that you have been placed. Then, when you’ve finally sat down and looked around, repeat it like a mantra one last time from within to feel it.